Outdoors or in a well ventilated room on a covered surface lay out your wreath, leaves, pine cones, floral picks (if you want to alter their color) and your holiday ornament balls. Decide what objects you want to spray paint each color. It is suggested to do 2-3 balls in each color, the grapevine wreath and pine cones using Krylon® Coarse Stone Textured Finish in White Onyx. Read the safety instructions on the back of each can before using. 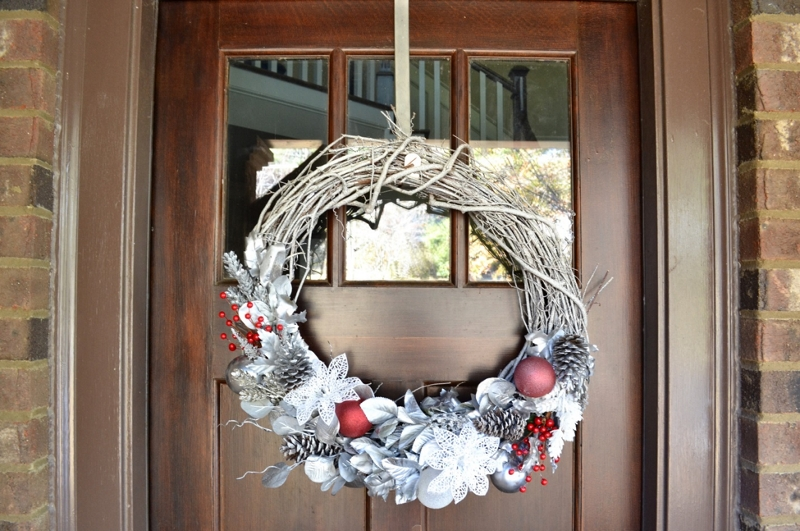 Apply 1-2 coats of Krylon® Coarse Stone Textured Finish in White Onyx to the grapevine wreath and pine cones. In order to create a snow texture, use heavier coats. Spray additional items with Krylon® Premium Metallic in Silver Foil and Krylon® Glitter Blast™ in Cherry Bomb. Allow items to dry for 45 minutes. Start with large groupings of leaves that are still on the stems. Place each stem facing outward at the bottom left curve of the wreath. This will be used as the base for the beginning of the design. Fan out the design to the right and left by adding holiday ornaments, pine cones and floral picks, while maintaining visual balance. Add loose metallic leaves to complement the design and fill in the gaps. Once the final look is achieved snap a quick picture with your phone so you remember the design in case it gets shifted during attachment. Take off the leaves and utilize the floral wire and hot glue gun to attach each object to the wreath.